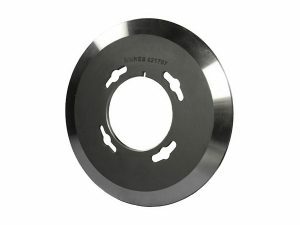 Top Knives/Slitters/Blades Manufactured from finest quality tool steels. These slitting knives / blades are stocked made from a variety of metallurgies providing our slitting customers with the right balance between economy and knife life. Dienes’ 100 years of experience manufacturing knives has given us the expertize and know how both in heat treating and grinding to produce the very best the market has available. Working with highly trained slitting experts we can recommend a variety of bevel configurations, single, double, or double hollow bevel, optimizing your cut quality. Polished, super finished, and Teflon coated knives are available to reduce adhesive build up and lessen dust generation as a result of the slitting action. Top/Male blades are stocked with a variety of bolt hole patterns and mounting configurations. Dienes stocks knives to fit many different OEM slitters. Knife Longevity, Cut quality and Economy; Call Dienes.